From left to right, WCU Assistant Vice Chancellor for Development Advancement Jamie Raynor, Harrah's Cherokee Regional Community Relations Coordinator Janna Hyatt, Paws the Catamount, Harrah's Cherokee Regional Vice President of Human Resources and Community Relations Jo Ray, WCU Associate Athletic Director for External Affairs Chad Gerrety. 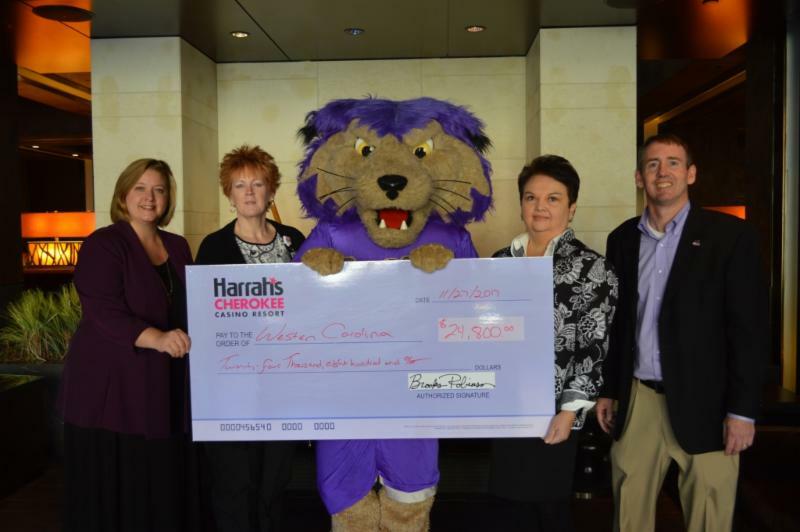 Harrah's Cherokee presented a check for $24,800 to Western Carolina University officials and Paws, the Catamount mascot. Monies will be used to support student initiatives in addition to Catamount athletics. Jamie Raynor, Assistant Vice Chancellor for Development Advancement was excited to continue the partnership. "Harrah's Cherokee Casino Resort and Western Carolina University (WCU) continue to be two of the strongest economic engines in Western North Carolina. The WCU Foundation is grateful for the support of Harrah's Cherokee Casino for the WCU College of Business, alumni engagement, continuing education initiatives like Life@WesternCarolina, community and student engagement such as Mountain Heritage Day and the Tuckaseegee River cleanup project, and Catamount Athletics." Regional Vice President of Human Resources and Community Relations Jo Ray said that the ongoing partnership is instrumental to Harrah's Cherokee. "Education is one of the key areas of focus for us. WCU is a huge presence in the area and makes a major difference in the lives of so many through education, and this is really a win-win for everyone involved."